SentenceShaper language software - Psycholinguistic Technologies, Inc. This page describes the program’s rich array of features. But if you want to plunge in and get a feel for what speech created with the program actually sounds like, you could start by visiting our ‘Hear it for Yourself!’ Videos page (click here). Research studies have demonstrated that SentenceShaper can help people with aphasia to create better speech, and that this effect may carry over into spontaneous speech. Thus the program can be used as a communication aid, a therapy tool, or both. Both these functions are supported by a host of additional program features. Workbooks: SentenceShaper includes built-in workbooks to make your speech practice more interesting and effective. Workbooks can zero in on particular linguistic structures or help you create speech about your life. A SentenceShaper workbook is a series of screens, or “pages”, each with its own picture, spoken prompt, and word-finding support. When you run a workbook, you create speech on each page. 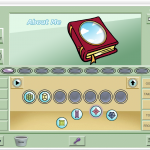 Create customized materials: The program also includes creativity tools to let you import pictures, customize the word-finding support, and create or edit workbooks. Sharing your speech files: Although SentenceShaper runs on Windows (click here for system requirements), the spoken messages you create with the program can be played on almost any computer or mobile device. The new Export feature lets you share your speech by emailing it, or turning it into a video that you can post on the Internet or play on your iPod or iPad. 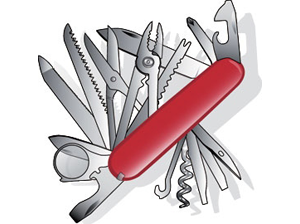 Versatility: Because of its rich functionality and flexibility, SentenceShaper can be seen as a “Swiss Army Knife” for people with mild-to-moderate language disorders.